Kyu Shiba Rikyu Garden is a popular traditional garden in Tokyo, surrounded by buildings, bringing you the classic combination of old and modern Japan. 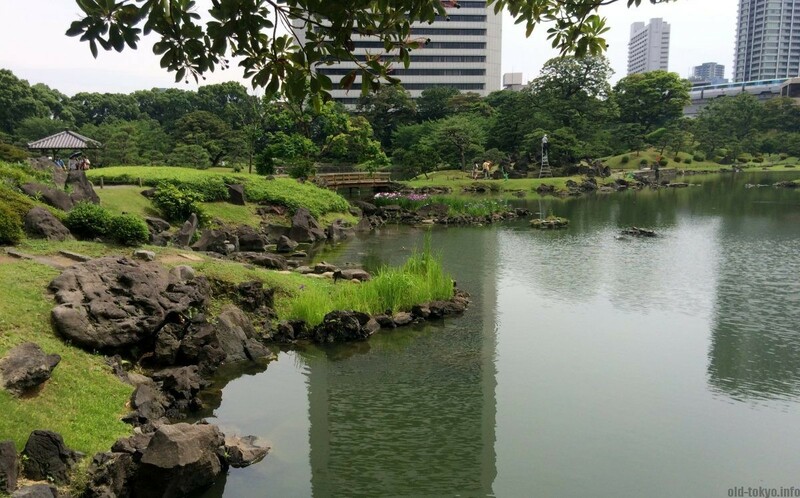 While it is a pleasant garden, I must immediately add that there are many more gardens in Tokyo, which are more impressive (such as Rikugien or Korakuen). My interest to visit this garden was as part of my quest to look for the remnants of Edo period feudal lord mansions. This garden is one of the few remaining gardens (also called clan gardens), another example is Koishikawa Korakuen. As I wrote in my article on the Red Gate at Tokyo University, one of the things that is unique for Tokyo is its history as capital for over 400 years. The Edo policy of sankin-kōtai required each major feudal lord to reside regularly in the capital for a considerable amount of time, requiring him to build a residence worthy of his status in Edo, as well as in his own territory. This garden was established in 1686 by Tadatomo Ōkubo (1632-1712), feudal lord (daimyō) during the Edo period. He moved around a lot as daimyō unlike many other lords that were connected to just one domain. He was assigned first to the Karatsu domain (all the way in Kyushu), then the Sakura domain (in Chiba prefecture near Tokyo) and finally the Odawara domain (in Kanagawa prefecture near Tokyo). Domains were usually held by families, but in the case of the Karatsu domain, as there was no heir in the mid-century, the domain was confiscated by the central government that led to a system where families with good connections to the ruling Tokugawa Shogunate got rotated at these domains. The garden was established in 1686 at the time when Ōkubo moved to the Odawara domain. The land, on which it was built, was just decades before reclaimed from the sea, and Ōkubo used the land to make it the home of his main Edo mansion. He brought in garden designers from his new Odawara domain and called his garden Rakujuen (楽寿園), which means something like fun long life garden (the garden is not called Rakujuen anymore, in fact, not to be confused with the garden with the same name in Shizuoka prefecture). The garden changed ownership several times before being bought by the Imperial household in 1875. In 1924 is was opened as a park after the palace that went together with this garden was lost to fire due to the Great Kanto Earthquake in 1923. The large pond (sensui): it takes up most of the space in the garden and is the defining feature. It was made to resemble Lake Xi Hu in Zheijiang (China) and has two islands in it. West lake bridge (seiko no tsutsumi): Modeled after the West Lake in Hangzhou (Zhejiang) in China, this bridge was seen in ancient times as an inspiration for poems and paintings. The stone bridge is very long with only in the middle a small stone arch. All in grey stone. The large hill (oyama): This is the highest point in the garden from which you have a nice view over the garden. The dry waterfall (karetaki): A rock formation that looks like a waterfall. These rocks are in between the large hill and the pond. The Wisteria trellis is particularly famous in this garden, usually blooming early May. In order to find out which flowers and plants blooms at which time, check the flower calendar on the official website. 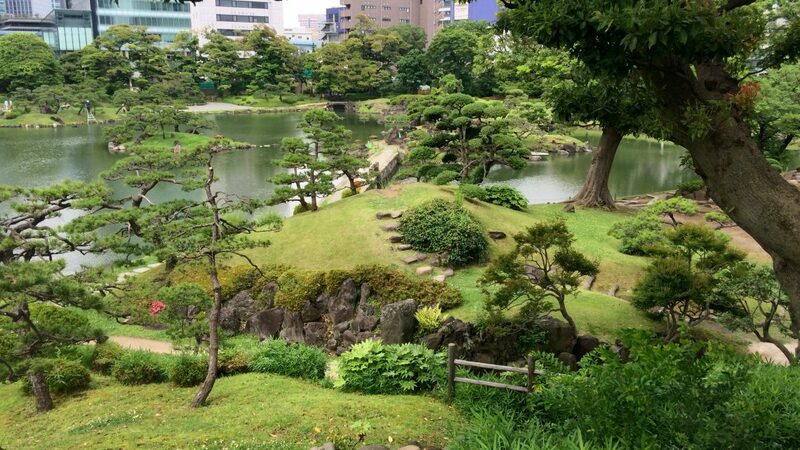 I found the garden to be quite general, not coming close to the other truly spectacular gardens in Tokyo. The surrounding buildings are often touted as making it special, but I guess I do not agree with that. In case you do not visit any other garden in Tokyo, the experience can be nice, but otherwise I would skip this one.